This is such an easy and delish soup. I call it a dump soup. The hardest part is boiling and deboning the chicken. This has become a family favorite and has been adapted over the years. One more tip, eat the soup right away after you put the chips in it; otherwise, the chips will get soggy.I like to put my chips on top. Boil the chicken in just enough water to cover chicken. Add in 1 Tbsp salt and boil chicken for 30 minutes. Remove chicken from stock; debone and shred chicken. Place chicken, chicken stock, beans, corn, salsa, spices, cilantro, hot sauce into Crock-Pot. Allow soup to sit on low for 4 - 6 hours to develop flavors. This can also be cooked on the stove - simmer gently for an hour. 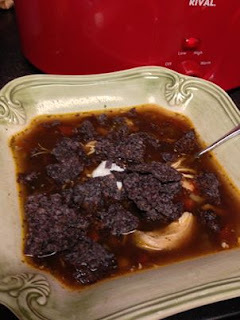 To serve: ladel soup into bowl, sprinkle with pepperjack or mexican blend cheese; add slightly broken up chips on top and then Eat right away so the chips stay crisp! *Make stock stronger by adding in onion, celery, carrot, garlic, tomato scraps. When prepping vegetables for other recipes, place trash unused portions of vegetables into a freezer bag and use when you are ready to make stock. Another variation is to puree a few roasted red and green peppers, (pablano or other similar peppers) a jalapeno, garlic, and onion and then add this puree to your Crock-Pot. It gives it a wonderful depth of flavor.